Earlier this fall, ESW partnered with Rocky Mountain Bride and some of our favorite creative wedding partners to put together an amazing Havana Dream – Cuban Rehearsal Dinner styled shoot at the newly minted event space at the Breckenridge Distillery. Not only was it amazing to see this vision come to life in print in Rocky Mountain Bride’s fall Colorado issue, but the Distillery’s space is incredible! If you’re getting married in Breckenridge, this location should be on your list. 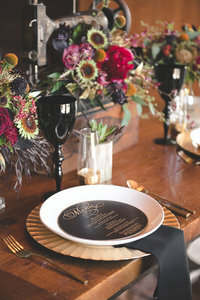 See Rocky Mountain Bride’s Online Issue here. And here are some additional pictures from the shoot (there were too many to publish them all, so we’ll share them here). I featured a tweed charcol linen with a beautiful Spanish tile next to the place setting to add some boldness and fun, it’s also served as the seat identifier, as calligraphied names sat on top of the tile. In keeping with the vibrant and playful nature of Cuban anything, I also featured these patterned plates. But, I mean, this food was to die for (it was as good as it looks!). I know our models, Abbey and Tony (who were recently engaged!) enjoyed getting to try all these amazing cocktails that we whipped up too. If you like something a little spicy, be sure to check out the Chili Vodka Marg. We also tried the Willie’s Boubloon Mojito and of course the Perfect Mule. In an effort to do something a little differently, instead of traditional dessert, we opted to showcase the Distillery’s Chocolate and Bourbon pairing in their amazing barrel room.